Yes, there is such a thing as "geek theatre," and playwright Qui Nguyen is one of its bright lights. Note that on his own site, he's chosen to refer to himself as "Playwriter, Screenwriter, Geek!" And it appears in a font that looks like it came right out of a comic book. As co-artistic director and co-founder of Vampire Cowboys, a New York theater company often credited for creating the concept of geek theatre, Nguyen has worked to show that theaters can be a perfect venue for fans of comic books, video and role-playing games, science fiction and fantasy, and, in general, people who understand and identify with underdogs and outsiders. Although Nguyen won the 2015 Steinberg/ATCA New Play Award for Vietgone, a more autobiographic piece, his 2011 play She Kills Monsters falls squarely in the geek theatre category, sending a woman named Agnes head over heels into the world of Dungeons and Dragons in an attempt to understand her younger sister Tilly's death. It's been described as "a high-octane dramatic comedy laden with homicidal fairies, nasty ogres, and 90s pop culture" and "a heart-pounding homage to the geek and warrior within us all." 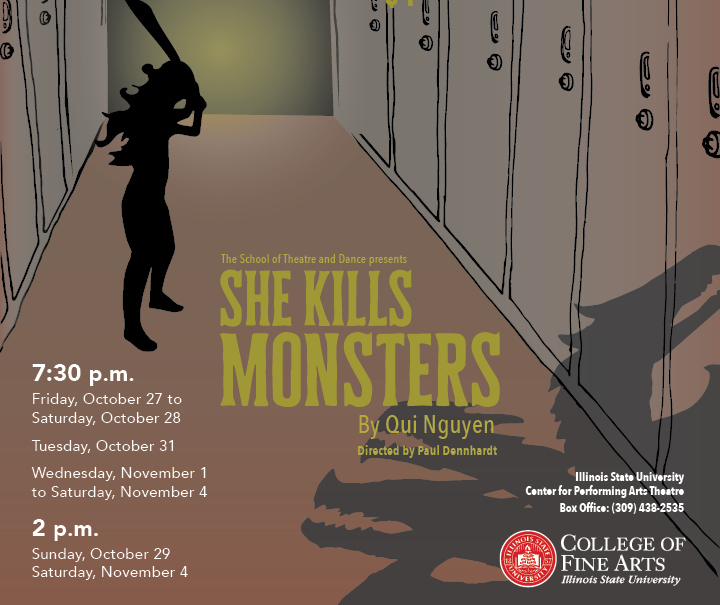 Director Paul Dennhardt brings She Kills Monsters to the Illinois State University Center for the Performing Arts starting tonight, with performances running through Saturday, November 4. Dennhardt is a professor of theatre at ISU as well as an expert in stage combat and movement and a perfect choice for a play filled with swords and battles on an epic scale. To create the fantastic world of the play, Dennhardt is working with ISU colleagues John Stark, the scenic designer tasked with putting this imaginary world on stage, Michael Vetere, a puppet-master who can create dragons out of whole cloth, and costume designer Amanda Vander Byl to help bring life to the characters of She Kills Monsters, both real and imaginary. Dennhardt has also enlisted Vertigo Rigging Company to make his warriors fly high (literally). For ISU, Johanna Kerber will play Agnes, with Spencer Brady as her little sister Tilly. Actors Jacob Artner, Autumn Egger, Josh Harris, Lauren Hickle, Kayla Jones, Angie Milton, Becky Murphy, Tyler Szarabajka, Chloe Szot and Jack Van Boven were cast to fill out both Dungeons and the real world with heroes and villains. 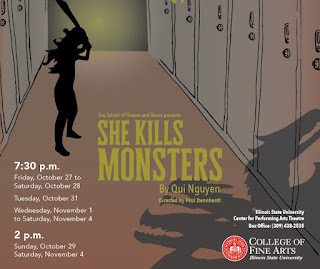 For information about upcoming performances of She Kills Monsters, click here or here.The show's Facebook page also has ticket information.